The Amalgamated Youths Forum in Taraba state on Saturday, February 17 urged President Muhammadu Buhari to re-contest in 2019 so as to enable him to consolidate on the good work he started in 2015. The chairman of the forum, Alhaji Murtala Maihula, who made the call in Jalingo at rally organised by the youths from the 16 local government areas of the state, said that the country was better off under the leadership of President Buhari. He added that many programmes and projects had been initiated to improve the fortunes of the ordinary Nigerians. According to him, the present administration was fighting corruption vigorously to save the country from collapse and for which, he said, it deserved a second term to consolidate these laudable achievements. 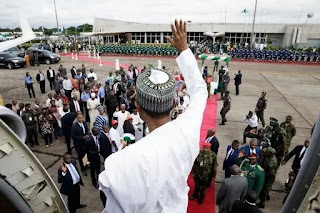 The chairman maintained that despite his health challenges, President Buhari has been able to bring development into sectors such as railway transportation, power, agriculture and also provided employment opportunities to millions of Nigerian youths. Maihula explained that the Mambilla Hydro-Power Plant was being executed in Taraba state by the Buhari administration. He added that the people of the state and youths in particular have no option than to encourage Buhari to contest again in 2019.